Official commencements took place the month before at UCSC, but some special students had a ceremony of their own July 10. 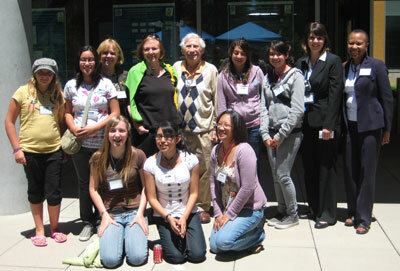 Twenty-seven youngsters from Santa Cruz and Monterey counties graduated from the two-week Girls in Engineering academic enrichment program for middle school girls, a UCSC initiative started in 2006 that runs under the umbrella of the Educational Partnership Center in partnership with the Jack Baskin School of Engineering. The graduation ceremony, which capped a week of science and engineering activities, talks, and campus tours for the girls, was a fun event, said program director Amy Stucky. "I love seeing these girls get really excited about science and engineering activities, and how they can continue down these pathways in their future," said Stucky, who is, herself, a scientist by training. "It's great to feel their energy." Girls in Engineering (GIE) brings sixth- through eighth-grade girls with an interest in mathematics together on campus for a unique introduction to engineering. Students from as far south as Greenfield and as far north as Boulder Creek get hands-on exposure to engineering through fun projects, such as building and programming a robot. The program, which is free for participants and includes transportation and lunch, enables girls to imagine themselves as future engineers and exposes them to science, technology, engineering, and mathematics (STEM) college and career pathways. Students learn about a variety of topics, including robotics, computer science, electrical and civil engineering, applied mechanics, environmental engineering, and biomedical engineering. Peggy Downes Baskin, wife of UCSC Foundation trustee Jack Baskin, helped create and fund GIE with $60,000 in gift support since its founding. Downes Baskin taught politics at Santa Clara University for 18 years and has also taught women's studies at UCSC. The Baskins are longtime supporters of the campus. Their financial contributions helped establish and grow the Baskin School of Engineering, UCSC's first professional school. Downes Baskin was the visionary for the GIE program, said Stucky. "She noticed there was a huge disparity in the number of men compared with the number of women in field, so she decided it would be a good idea to start a program that would give more females an opportunity to learn about college and career pathways in engineering and technology," Stucky said. "She did some research and found the best age group to target is the middle school age because it's right after that that girls' interest in those fields start to fall off." The program has also received grant support from organizations including the Cisco Foundation, the Bechtel Foundation, and the Santa Cruz County Office of Education. This year, students from Branciforte, Chualar, Fairview, Lakeview, North Monterey County, Rolling Hills, San Lorenzo Valley, and Vista Verde middle schools participated. "I sit in periodically with classes, and it's so much fun to see them working together in teams, finding groups that are really supportive of females in science and engineering," Stucky said. "It's exciting to hear them say things like, 'I never really thought that females could be in engineering, but now I know I can do anything.'"